Racine Harbor had been continuously lighted since 1838 when the Root River lighthouse became one of the first lights to be constructed on Lake Michigan. Maritime commerce in and out of Racine harbor experience continued growth, and the piers continued to be lengthened commensurately to contain an ever expanding area of protection. With such lengthening, It was inevitable that a pier head light would also be needed to mark the ends of the lengthened piers, and to that end a Lighthouse Board work party arrived in Racine in July, 1872 to construct a standard wooden beacon light with elevated walk at the outer end of the north pier. Work progressed quickly, with the new light exhibited for the first time on the night of September 5 of that year. The old 1838 coast light was demolished in 1876, its timbers and bricks reportedly used in the construction of a private dwelling. As part of an improvement project being undertaken on all of Lake Michigan's pierhead lights under Eleventh District Engineer Major Milton B. Adams, a conduit system for the pierhead light was constructed on the north pier, designed to allow the lamp to be fueled and maintained from a point shoreward of the beacon. With the illumination of this mew conduit-mounted light on the night of May 28, 1894, the pierhead beacon was discontinued. Unfortunately, while Major Adams' conduit system sounded like an excellent idea, it was found to be less than reliable, and once again a pierhead light with a Sixth Order Fresnel and fog bell was reestablished on the north pier on June 18, 1969, the conduit system removed, and 438 feet of elevated walk constructed in its place. In order to further increase the protected harbor area, twin breakwaters were constructed around the harbor in the late 1890's. With the completion of these a temporary fixed red lens lantern was established at the southerly end of the breakwater on October 13, 1900. Also in this year, it was decided to replace the 1865 Root River Light with a larger steel light at the pierhead. To this end, the old wooden beacon was temporarily moved 24 feet towards the end of the pier to allow space for the construction of a concrete crib to support the new heavier steel tower. Contracts for supplying the steel and cast iron for the new light were issued, and the materials were delivered at the Milwaukee depot. The materials were subsequently transported to Racine, where the tower was erected on the pierhead, and exhibited for the first time on the night of November 23, 1902, and the wooden pierhead light was demolished. With the establishment of this new light, the 1865 Light was simultaneously discontinued, and work began on converting the old station into a dwelling large enough for the head keeper and his assistant. In 1910, iron and steel was delivered to the harbor for the construction of an improved breakwater structure. When erected, the new steel tower stood 46 feet tall, with its fixed red Fourth Order Fresnel placed at a focal plane of 53 feet and a visibility range of 14 miles in clear weather. By 192, the tower had been equipped with an air-powered diaphone fog-signal with a 20 second characteristic consisting of a one-second blast followed by 2 seconds of silence, a second blast of 1 second followed by 16 seconds of silence. With the assumption of responsibility for aids to navigation in 1939, the old 1865 station and the adjacent life-saving station became united as part of the new Racine Coast Guard Station. After having seen their treasured Racine Reef Light fall to the wrecking ball at the hands of the Army Corps of Engineers in 1961, when the people of Racine heard that the Coast Guard was planning on putting the Pierhead Light under the wrecking ball in 1987, a huge public outcry arose, and the structure was saved to be incorporated incorporated as a featured part of the new Reefpoint Marina complex, where it can be seen to this day. 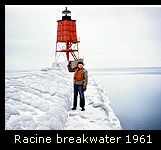 Click Here to see a complete listing of all Racine North Breakwater Light keepers compiled by Phyllis L. Tag of Great Lakes Lighthouse Research. Racine Harbor has obviously seen a great deal of renovation in recent years, with landscaping and observation points spread between the breakwaters, around the marina and the harbor entrance. We made our way out to the harbor entrance and climbed the observation tower that sits directly across the channel from the lighthouse. From the number of small boats that were trolling up and down the cannel, it was plain to see that the salmon were running. We took a couple of photographs of the light, and dismounted the platform to wander the marina. As we walked around the marina, we saw a number of fishermen sitting along the piers and breakwaters. A number of them had salmon lying on the bank behind them, some of which were incredibly large. From I-94, take Hwy 20 east. Hwy 20 eventually becomes Washington Ave. Follow Washington Ave. to Hwy 32, and head north on Hwy 32. Turn right on Christopher Columbus Causeway, and follow around the marina until the road ends in a parking area. Walk the short distance to the lighthouse at the marina entrance. 1961 photograph of the Racine Coast Guard station by Jerry Schober. Photograph from the Racine Historical Society collection. Personal observation at Racine Harbor, 09/08/2000 & 09/09/2000.